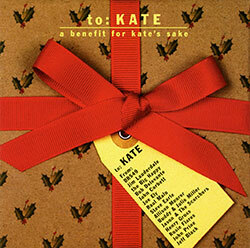 "To: Kate: A Benefit for Kate's Sake" is a great Christmas compilation CD, put together by Garry Tallent. Garry gathered a host of Americana music's most noted singers, songwriters, and musicians, including Buddy & Julie Miller, Joe Ely, Jason & the Scorchers, Raul Malo, Steve Earle & Allison Moorer, and John Prine -- see below for the full track listing. It's a pretty even mix of new, original Christmas songs along with some different takes on well-known favorites -- great stuff. And Garry himself produced and played bass on half of the tracks. The project benefits "For Kate's Sake," a fundraising effort to help the Kirk family of Nashville, whose two little girls, Kate and Caroline, were both afflicted with a rare and fatal genetic disorder called Neimann-Pick Disease Type A/B. See www.forkatessake.org for more information. Caroline, sadly, has passed away; Kate is still receiving special care. Garry says, "Our hope is to raise money for this cause while spreading some cheer in the process"; all royalties from this album will go to the Children's Organ Transplant Association (COTA) and to "For Kate's Sake." In addition, Backstreet Records will be donating all profits from the sale of this album to "For Kate's Sake."